An excellent action-horror sequel. 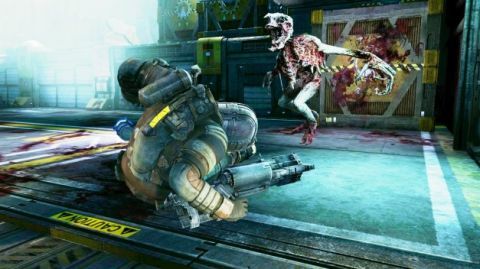 Dead Space 2 doesnt try to innovate, but its a highly polished alien-rending experience. The “Previously, on Dead Space” video is a nice touch, though it reminds me how similar Dead Space 2's premise and gameplay are to the last one. This time Isaac Clarke awakens on a facility on Saturn's moon Titan, three years after the rescue-mission-gone-awry on the mining ship Ishimura, and finds a very familiar situation: Titan is overrun with space zombies called Necromorphs that have set about the meticulous dismemberment of everyone in sight—and he's still having hallucinations of his dead girlfriend. It also highlights that DS2 is a better sci-fi horror game, in a lot of subtle but important ways. While the plot is similar, the storytelling technique has changed for the better—Isaac has recovered from a bout of Gordon Freeman Syndrome (inexplicable muteness), and the voice performances are excellent. But the real star is the environment: for the entirety of the eight-hour campaign, Visceral does an expert job of making you feel in constant peril, alternating between tingling your spine with unsettling scenery and audio and trying to rip it out of your body by way of horrific monsters. Fighting a Necro is different from other videogame enemies, in that shooting its head is like shooting a grizzly in the foot—it barely slows it down, and just makes it angrier. Picking off limbs takes them down quicker, requiring multiple accurate shots per target—which makes the smooth controls greatly appreciated. DS2 has a zoo's worth of different varieties of spitting, charging, wall-crawling nasties (including evil space-babies), and each puts up a hell of a fight. The first time I was hunted by the new Stalkers was one of the most frightening moments of the game—I caught a shadowy movement behind some crates out of the corner of my eye, but I found nothing there. I heard a chirping noise, and spun around to see a velociraptor-like creature charging toward me. With a scream it smashed me to the floor, then nimbly darted away, intelligently using cover to escape before I could hit its legs. Then, more chirping—and I realized I was surrounded. Clever girl. Most of the 15 stages have a unique look to them (as unique as possible given that they're mostly metal corridors), from the wrecked residential areas to the Necro-worshiping Unitologist temple to the EarthGov zone, and they're punctuated by floaty zero-G areas. You have all the same tools as before—the upgradable Rig suit is equipped with time-slowing and telekinesis powers—but the levels are designed well and don't overuse any one gimmick. That includes enemies that must be defeated by blasting their glowing yellow bits. The new multiplayer owes a lot to Left 4 Dead's example: four human players fight their way through a gauntlet of objectives while four class-based Necro players and AI-controlled backup zombies assail them from all sides. It's fun, and produces some nail-biting finishes, but aside from making you unlock equipment with experience (which I don't personally care for), it doesn't do anything we haven't seen before. Overall, besides retaining the irritation of having to seek out a save station to avoid losing progress when I want to quit, DS2 is a smartly improved version of the original. It's not a new experience, but it's a hair-raiser nonetheless.